The patient’s estimation of his disease activity (more here). A more complete paradigm which includes various aspects of the disease. Earlier this year, a Viennese study discussed the need for more attention to cartilage during RA diagnosis. The study, Physical disability in rheumatoid arthritis is associated with cartilage damage rather than bone destruction, published in the Annals of Rheumatic Diseases, showed that cartilage may be more important than bone erosion as a measure of disease. Why would we monitor what is going on in early disease? If a clinician tells a patient, “You don’t look like you have any inflammation,” the odds are that you still do. Note 2: If you have any trouble opening the original study, paste the title and “published in Annals of the Rheumatic Diseases” into a Google search and click the top link. Ultrasound series shows why it’s not commonly performed in the U.S. – yet! Well, that’s currently my worst issue- tendon pain and inflammation! In fact, that’s how my first episode (in my teens) started, with abdominal pain and unexplained tendonitis in my wrists. My rheumatologist bases my RA activity solely on swollen joints of my hands. I have tenosynovitis of all tendons in my hips, thumbs and left forearm to wrist, which is never mentioned during exam as being more of an indicator of my inflammatory status. I have a chronically elevated white blood cell count that a hematologist says is due to my RA, he disagrees. Frustrating! My last rheum doc, the only one who has ever examined me, put that dx in my chart too – for several joints – Now that I know a little of what it is, I know it was one of the first RA sx in my joints – most of them. Wonder why they can’t agree about the white count? How frustrating. I have had “trigger finger” as a frequent part of how RA affects me. I was reflecting on how I was diagnosed some 18 years ago, and what a nonspecific and difficult journey that was! That led me to this article, and maybe you have already referenced this study , Kelly. I found it interesting , as it talks about the strengths/weaknesses of CT, MRI,bone scans, and regular xrays, in the early stages of RA. The earlier we get it diagnosed, the sooner we can attack it.! great minds think alike – I have something 1/2 written that issue – if i don’t have it already, this one will come in handy – there is a lot being learned about RA and the diff ways to image diff aspects of it. So what do I do when the doc and I disagree about whether or not something is even swollen? lol. I am one of the lucky ones who “pass” the blood test, yet 2 rheumies have said that my hands/knuckles/wrists/ankles are not swollen, though I know very well that they are due to me, well, being me in the past, and knowing what they should look like, opposed to what they do look like. Actually, my MD first noticed my swollen hands before I did, and my hubs was absolutely mortified by my ankles when he saw them swell (he’s a leg man, he KNOWS what my ankles look like lol). There will be a post soon that compares some imaging techniques – it depends on the joint which works better – and it also REALLY depends upon the skill of the user/reader of the image. It’s my understanding from the links in this post, that the cartilage does not grow back as readily as bone can (only when the inflammation has been stopped). Thank you Melanie. Welcome aboard! PS: have you clicked on the RA Map, yet? It’s a great way to get started here. Thanks for the informative post. This was confirmed by my orthopedic surgeon this week. He said the cartilage destruction in my knees is due to RA which is then worsened by wear and tear (osteoarthritis). Then he mentioned that the ongoing Achilles tendon tears in my heel are indicative of RA. Soft tissue damage is real and debilitating. I’m getting ready for the third surgery to repair RA caused damage to soft tissue. And that’s on top of the bone erosion that is wrecking havoc on my heel bones and fingers. And this is all occurring in the absence of any positive blood markers and while taking Humira. sigh. Sorry to see the academic reality proving itself in you, Andrew. This is fascinating to me. I was dx with RA at age 10, I turn 40 in a few months. One of the problems that has plagued me since the beginning is inflammation of the tendons of my feet. I was also told firmly it was unrelated to my RA. The inflammation in the arch of my foot finally gained a name: plantar fascitis. This through an offhand remark by a PT 5 yrs ago after asking, for the 100th time, why the tendons in my feet hurt so much. Currently, I have an inflamed tendon on the top of my right foot (from my middle toes up to my ankle). Icing it seems to help, but some days it is sooo painful and swollen. After years of solving my feet problems by wearing Dansko shoes and rarely going barefoot, I now have to go the opposite route, and go barefoot as much as possible, and wear Haflinger slip on clogs which are almost like going barefoot. Anything else and the tendons start screaming. Of course, now that I’ve put on weight thanks to the long term TNF usage, I get the “lose some weight and your feet will stop hurting”. I don’t think so, since my feet hurt the same when I was 11yo and weighed 70lbs! And the only shoes that my feet like are shoes that are not touching my feet. Kelly, when did you sneak the pics of my toes??? Don’t you remember the time you posted your feet and I said: omg those look like mine? In the last four months it feels like I’m “popping” ligaments in my feet and hands. I was just told have planters fascitis (sp) in my feet. Then they tell you to get up and get more exercise… WHAT??? You tell me to stay OFF my feet but to get UP and do exercise. My right hip this last two weeks has been grinding and I’m not happy at the prospect of what it likely is. This is so very painful yet, I keep moving in fear of my bones fusing. The migraines I get while flaring are HORRIFIC. I’m exhausted with all the conflict amongst doctors themselves about one believing it’s one symptom and another believing completely different. so far i’m lucky with my rheumy but I believe the next visit is going to be challenging. I have serious complaints of pain and in my area, we are loaded with addicts so it’s dealt with with kids gloves. So far he has completely respected my pain. But if I can’t walk and then when I do it hurts to go forward, with hips, how do I accomplish the simplest of tasks? i do it, but in great pain. Your information, the wealth of it is mind blowing and awesome. OMG!!!! Seriously, several years ago I went to my GP complaining that my toes felt like I had string wrapped around them, and they would cramp into horrible positions like your pictures. I would have to walk and walk to get them out of their crampi-ness. I felt like a complete nut case going in complaining of this, I also was saying that my shoulder hurt and my knee. She said, “I was getting old!” I still to this day have that feeling. But now my toes look horrible, all hammertoe-ish. My rheumy looked at me surprised that my toes didn’t bother me much. I guess I’m used to it now. But that is what my fingers are doing but on a different level. They cramp up. My lovely rheumy said it must be a deficiency of some kind. But my sage hand therapist says, its the ligaments popping up to the top of the finger and causing the finger to shift out of alignement. why oh, why do we have to struggle to get people – our doctors to listen to us? That’s a good question. I’ve had a lot of foot cramping in my life (every time I want swimming in cool water). This is not the same as that so I think I would be afraid a dr would do the same thing to me as was done to you – Last winter, the “pulling” sensation into a folded shape – the left picture – went on all winter – constantly. I would rip off my socs thinking some string was tugging at my toes… but there was not string – It was inside of my toes. For me, even though shoes hurt, they seem to straighten them out for a while – it’s why I call them my “everchanging feet” – almost no 2 days exactly the same. The podiatrist who first believed me that I had RA – 5.5 yrs ago said my toes were drifiting & showing splay. That was back when I thought my toes were perfectly normal – but he could see the subtle changes already. I too have often described the feeling of my toes being wrapped with bands & even used to feel if I had got something caught on them..until realised it was my RA. my toes are starting to bend & deform just like my fingers..But I wear red nail polish too!…we are still girls & want to look pretty. I have started to need a nap in the afternoons..this is not good as I work days & have a young family to look after too. my doctor said I should expect some tiredness & stiffness at my age..I am only 52 but sometimes feel 92 when I get up in the mornings..I have to ease gently into the day..not easy when you have 2 children to organise for school. I am awaiting some more blood tests & scans to see the extent of the damage. I try not to moan about my aches & pains as people dont take me seriosly..they think I am exaggerating & well meaning friends say I am just a bit ‘run down’ The pain is all the time & like hot needles in all my inflamed joints, especially shoulder & ankle joints & I have to use gadgets to open jars, just like my granny used to. I also agree with you that I can’t “talk” about it with anyone in the way I think they’d understand – it sounds too much like exaggerating – I remember a blog post 2 yrs ago – the 1st one i ever wrote about my own RA – I said something like “who could believe in this much RA?” I still feel that way around most people. Hi my name is john I have rhumatoid arthritis recently diagnosed about 1 year ago. I am currently taking plaquenil generic two times a day 200mg each time.Since the increase in meds the pain and stiffness has calmed down. My DR has asked me if I ever took methotrexate, humera, enbrel or any of the other dmards and I told her no I have looked online at all the sideeffects and don’t like what I see.I am scared and very concerned of the side effects.They can cause all kinds of side effects including a rare and fatal form of cancer. I have had major health issues since I retired in 2006 and don’t need any more.What I don’t know or understand is since the RA has calmed down is it nessary to try the dmards I don’t know and am very confused.Right now I need all the advise and support I can get.I am 63 years old and also have fibromyalgia,and osteoarthritis and a host of other medical problems.I will listen to all that will help thank you for taking the time to read this post. As I was reading about the cartilege, I’m thinking to myself, “well,DUH!!!! You have to have the CARTILEGE to keep the BONE from rubbing together causing damage!! !” I guess this confirms for me once again how awesome my rheumy is. She and I talk about this every month. She asks me about my pain level even when there isn’t swelling and she understands that even when there is no swelling visible, there can still be swelling and damage being done. She will do Xrays without me having to beg her to. I suppose the thing that amazes me is that rheumys can discount something that is so incredibly obvious, I really don’t get it. I too get the tenosynovitis part, especially in my hands and feet, occasionally in my hips. There are times that it almost hurts worse than the other RA pains. When I had my arch of my foot fused a couple of years ago, my surgeon also had to go in and stretch my Achillies Tendon out because it was shrinking due to the inflammation and was causing the other tendons in my foot to be inflamed. Sometimes it amazes me how we as patients know more about this disease than the so called professionals. So much of it is so obvious that I guess it is one of those “if it were a snake…” things? I think Rheumatologists do not give enough importance to the tenosynovitis factor, neither in the diagnostic phase or in the dissease control . Much of the often “unseen” inflammation described by RA patients may be coming of it, while doctors keep seeking for the pea shaped joint due to swelling. Excellent comment, George. It believe the researchers in this piece would agree. 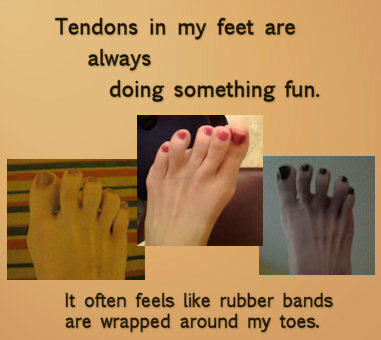 I am so glad you described your toes feeling like rubberbands around them. That is EXACTLY how my hips have felt for 10 years (although RA didn’t appear until 2years ago–so they say) No one could ever explain why. They STILL don’t diagnose that. But now I am certain, that it has been RA all along.